By putting technology to use, three hospitals have streamlined operations in the busiest of departments. What’s the difference between an emergency department (ED) with an information system (EDIS) and one without? According to some experts, the answers range from increased productivity and turnaround time, better documentation, less paper, and an overall better handle on the constant flux germane to this area of the hospital. Three facilities share their experiences, tips, and the unexpected benefits they encountered since implementing an EDIS. Steven Jones, MD, medical director of emergency services at Northridge (Calif.) Hospital Medical Center, has witnessed tremendous workflow improvements since implementing MEDHOST’s EDIS technology nearly two years ago. “We are generally your typical community emergency department, with about 47,000 patients coming through our doors each year,” says Jones. Northridge’s paperless system went live in two phases, first with nurse charting and tracking and then adding physician charting and computerized physician order entry one month later. Jones believes the two-phase approach is a good choice for larger facilities because it is such a huge change. As with any technology implementation, “growing pains” are part of the process. Jones called the initial implementation “disruptive and painful” at first, with the most noticeable inconvenience being an inevitable increase in the patients who left the facility without being seen. “But after a few days, it improved as staff became more familiar with the system,” says Jones. To avoid disruptions, Jones recommends doing training as much in advance as possible and upstaffing the hospital during busy times. In addition, Northridge had “super users” on site during the implementation to assist with any technical questions, and the vendor made trainers available 24/7 for a three-day period. An extensive selection and implementation process was followed to find a system that would not only meet the facility’s needs but also cater to the staff’s preferences. Jones attended an EDIS symposium sponsored by the Pennsylvania chapter of the American College of Emergency Physicians, which helped him learn about the drawbacks and developments of various systems. After the field was narrowed to five, each product was demonstrated to hospital staff, including technical neophytes and tech-savvy users. “To establish an equal playing field, we asked each vendor to provide a 45-minute webinar, and staff ranked their first, second, and third preference,” says Jones. To ensure the system would interface with other departments in maintaining proper workflow, lists were made of important functionalities, including must-have features, as well as those that would be nice to have. After each vendor demonstrated their systems, the staff voted for the product that seemed to be the best fit. The new technology’s patient tracking feature was a noticeable improvement over the previous method: a whiteboard with handwritten names detailing which patient went to which physician or room. “It is a unique tracking system that uses a floor plan rather than a list of names. It’s HIPAA compliant but gives a ton of information on any given patient, including such things as lab results, radiology information, how long they’ve been there, who their doctor is, and so on,” says Jones. On the billing side, the system has helped the facility optimize coding while allowing it to manipulate the system over the years to include billing for items such as smoking cessation programs. “We can make changes on the fly without having to wait for the EDIS company to come and make them for us,” says Jones. Like at most hospitals, overcrowding is an issue at Northridge. While Jones says the EDIS doesn’t generally serve as a great throughput device, depending on what system it is replacing, it brings information to the ED more quickly. The payoff is better documentation and information reaching the practitioners sooner. “I think the key is that this system adapts to your workflow; it’s quick, easy, intuitive, and changeable,” says Jones, adding that the touch-screen monitor feature enabled every staff member to adapt quickly to the new technology. “It’s so natural and native. [It] is so intuitive that it makes it easy to navigate applications and do charting,” he says. The system has also enabled Northridge to implement best practices in several areas. “There are a variety of quality measures tied to what a physician does in the ED, and we use order sets to drive that,” says Jones. The technology enables prompts for the appropriate course of action for a given situation and guides the physician or nurse to make appropriate patient care decisions. “It also gives me the ability to build and change these sets. I can update them based on current literature or new guidelines, which will guide practitioners to do the right thing,” he adds. Now that Northridge has eliminated its paper trail—where it ran into problems with “chart chasing”—better documentation has enabled it to capture more revenue. In fact, Northridge has increased average charge capture to $127 per patient simply because of improved documentation. “It’s a win-win for everyone,” says Jones. Laura Price, RN, MSN, nursing informatics manager at Huntsville (Ala.) Hospital, oversaw the implementation of its EDIS in September 2007. The project affected three facilities: the main ED, a pediatric ED, and a nine-bed urgent care facility. She says the Wellsoft system ties all three areas together and keeps operations consistent, with nuances added for the clinic or pediatric areas that don’t affect the others. While moving toward implementing the EDIS several years ago, the concept met some resistance, forcing Price to get buy-in from hospital leaders. Like Jones, she also attended the Pennsylvania EDIS symposium, where she was able to “look at and run various systems through the wringer.” Once she examined the candidates, it took eight to nine months for a final choice to be made. One of the EDIS’ major benefits is that the facility now uses less paper, with patient tracking, nurse/physician documentation, discharge instructions, prescriptions, and medication reconciliation all done within the system. Price says Huntsville did not encounter any interoperability issues, but it did have to deal with small nuances within Health Level Seven protocols that required a minimal amount of tweaking. The patient tracking feature chronicles everything from how many patients were seen and their status (admitted, left against medical advice, discharged) to requested information on bed assignments and turnaround times. The data can be used as a road map of the patient’s visit to track length of stay, arrival time, triage time, when a physician saw a patient, and discharge. “It also enables me to keep a monthly scorecard to know how many patients came through the door, which is important because our budget is based on the volume,” Price says. The system also interfaces with the lab and imaging departments to track when orders are entered, their status, and results. The set-up allows Price to get a better read on the patient experience. “If you’re at the ED for six hours, we have the data to explain exactly what the length of stay included. It also enables us to improve areas that can be streamlined and get people in and out while receiving the proper care as fast as possible,” she says. 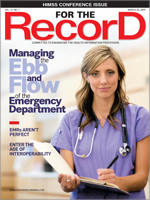 Having an EDIS fosters consistency, and the reports it generates have helped Price to identify bottlenecks, which allows the hospital to target specific areas for improvement. For example, there are often times when upstaffing is needed. To illustrate the point, Price can produce data documenting that there is higher volume during different times of the day. “We have a data-driven administration, which is great, so they are eager to see this information,” she says. Other data provide a detailed record of registration, turnaround times, and the number of elopements, allowing Price to track staff productivity by shift. “I can learn why some crews might take longer to perform certain tasks,” she says. When listing the technology’s other benefits, Price identifies improved communication between physicians and the nursing staff. For example, a primary care physician can access information about an ED visit through the autofax feature, which sends the complete ED record for follow-up. The medication reconciliation feature, which relays a summary of the patient’s drug history, eliminates the need for staff to fax that information. By having the ability to analyze historical data on ED patients, Huntsville is able to identify trends and demographical aberrations regarding implementing best practices. For example, the facility recently went live with core measures for pneumonia, based on protocol from the Centers for Medicare & Medicaid Services. To help improve compliance, the EDIS tags patients that the protocol suggests are at risk for pneumonia. “Emergency departments operate much differently than the inpatient side of the hospital, and many information systems aren’t designed for the ED, which is a niche market,” says Beth Yandell, RN, director of the ED at Conway (Ark.) Regional Medical Center, which implemented Logicare’s OnRecord EDIS more than one year ago. “We did our implementation right before Christmas, which I don’t recommend because it’s already a very stressful time,” she says, adding that given the chance to do it again, she would have undertaken more education beforehand considering how big of a change the hospital was about to undergo. The selection process was at times frustrating. Because the ED operates differently than an inpatient setting, Yandell would find a system that was proficient in one area but lacking in others. Having used Logicare on the inpatient side since the early ’90s, she knew that the quality and customer service were high. “Their vision and mine were the same,” she says. Now, the EDIS is showing its versatility. “We use the system for electronic triage, patient tracking, and order entry. When we moved to physician order entry, there was a learning curve but not a disruption—just a change to the process,” says Yandell, adding that interoperability was basically seamless, with just a few minor initial glitches. Meanwhile, the department reshaped its thinking. “We didn’t have staff changes, just attitude changes,” says Yandell, who mentions that the staff had different comfort levels using the technology. It was a matter of staff changing their thought processes, she says. “The computer directs you to get complete documentation, whereas in the past, it was each practitioner’s idea of what information was needed, with some very detailed and long and others very minimal. It keeps documentation the same across the board,” Yandell notes. An added benefit is that the physicians like it better, and the staff appreciate no longer having to worry about communication delays. “Order entry is a favorite feature because it is easy to use and not hard to find things. We have about 80% of orders put in by physicians when we were only hoping for about 50%,” says Yandell. On the other hand, the differences between clinical language and software language have proven to be a hurdle for nursing documentation. However, Yandell says that once the problem was identified, the vendor worked with them to find a resolution. Meanwhile, the EDIS continues to track and trend performance as it relates to core measures and data support clinical staff practices and help identify the need for additional education. Also, medication reconciliation remains a valuable tool in the quest to improve the quality of care. “The physicians do all of the medication reconciliation, and The Joint Commission loves it. It’s a hard goal to comply with, but the timing of Logicare’s release of that aspect worked great for our facility,” says Yandell. What’s on Yandell’s wish list? Better hardware for the ED. “The ED is a different environment and things break. We find hardware that is highly functional but fragile or very durable equipment that isn’t very functional,” she says. Finding that answer, Yandell says, would complete the EDIS circle.